Located on the 10th Floor of a modern office block in the heart of Manchester’s financial district, this fit out provides a contemporary, multi-functional office for an International Wealth Management facility. The approach to the design was to harness and reflect the company profile of excellence and professionalism, to produce a contemporary environment for day-to-day office working along with client liaison and hospitality. A clean palette of materials (timber, painted back glass and slate) are used in simple forms to create a visually unique and dynamic entrance area. 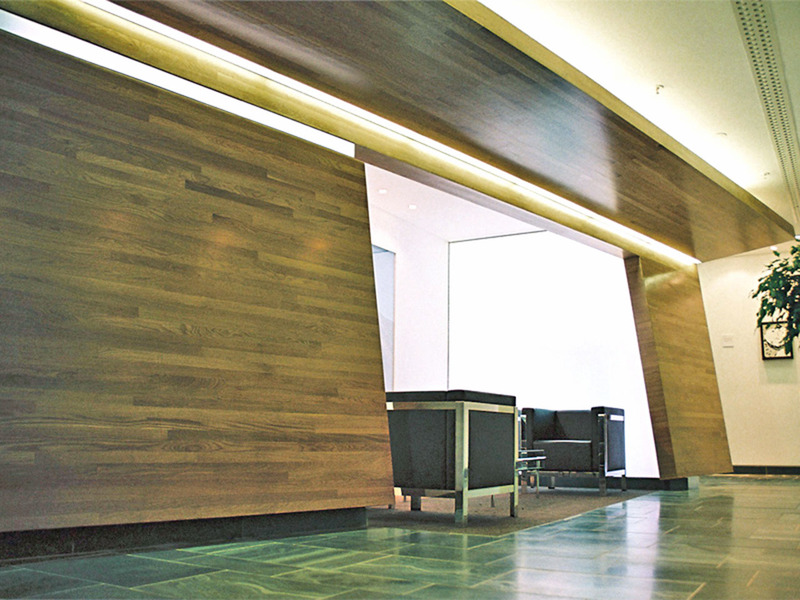 An inclined timber clad wall cuts through the entrance space to link all client related areas. This wall houses a recessed waiting area illuminated by a bespoke “light-wall” which continually changes the ambiance of the space through colour variations. Client Meeting Rooms are elegantly simplistic; feature ‘plane folds’ float within the space incorporating audio-visual technology indirect lighting; contemporary artwork installations. Cool greys and whites coalesce to fashion a minimalist design in the open plan office which characterises the modern efficiency of the working environment.